Every lesson from God’s Unfolding Story for Older Preschoolers includes a full-color teaching picture for use in teaching the lesson. This is the teaching picture for The People Honored Jesus (NT07L4TP). 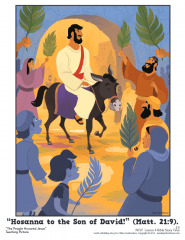 This Palm Sunday teaching picture supports both the Hour A and Hour B lesson plans for this Palm Sunday lesson about Jesus’ Triumphal Entry into Jerusalem on the Sunday prior to His crucifixion.